BE ATTITUDE FOR GAINS. Like Ikaruga before it, Treasure's cult shoot-em-up Radiant Silvergun is coming to XBLA. At 1200 Microsoft Points - around fifteen of your earth dollars - Radiant Silvergun's XBLA rerelease will be a little kinder on your wallet than an original copy for the Sega Saturn. Though not especially rare by collector standards, Radiant Silvergun's somewhat limited supply combined with almost universal acclaim (it really is that good, folks) means the notoriously fun shooter usually fetches around $200 plus on eBay. For those of you who haven't had the opportunity to play Silvergun, either because you never owned a Saturn or, for some odd reason, you never wandered into an arcade in 1990's Japan, rest assured the game is superb. 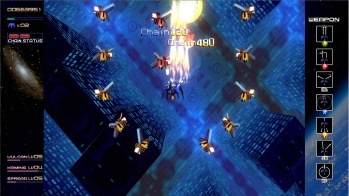 Silvergun is considered an almost perfect example of the SHMUP genre, not only for its fresh, but taxing, take on classic shooter gameplay, but also for its unique aesthetic and haunting soundtrack. It doesn't cost so much just because it's hard to find, if you catch my drift. As well as now costing less than a low-end used car, the XBLA release of Radiant Silvergun is bringing a few other improvements to the table. There's an option to replace Silvergun's excellent, but flawed, scoring system with the smoother, updated version from its successor Ikaruga. The game can be played in both "Saturn" and "Arcade" modes, and it features both local and online cooperative play. Hopefully they won't fix the notoriously poorly translated boss battle text which, although completely at odds with the game's rather grim storyline, was eminently memorable.